If your iPAQ screen is covered with tiny glowing white specs you need a dust clean and seal. 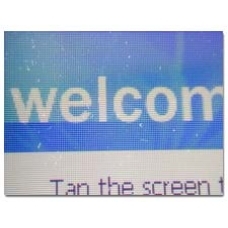 This is a known fault on the early model iPAQ screens, they were not sufficiently sealed and allowed dust and tiny glass particles to become trapped between the touch screen and the diffuser layer. The repair involves stripping down the LCD screen unit. Removing the dust and resealing the display with kapton tape, the diffuser layer is also sealed ensuring that recontamination should not occur. When cleaning a heavily contaminated screen the aim is to make it as good as new but this is not always possible, you will be informed if your screen does not clean up to a high standard.